if these trees could speak…. Above eight thousand feet, and among the granite of the Sierra Nevada mountains of the Yosemite Wilderness, life is hard. Weather extremes. Thin soil. Meager nutrients Bright, hot sun in summer. Bitter cold nights toward winter. Snow and ice most years from late October through April. Sometimes long years and decades of drought. In a place called Olmsted Point in the Yosemite Wilderness, the mountains have been shaped and polished by glaciers long vanished, wind and water over many millennia since. Looking at a tree whose roots has grown over and held it fast into a cleft in the rock, I am seeing not just a survivor of a difficult environment, but a victor. There are times I wonder whether such a tree would thrive if it had an easy life. But I recall a lesson I learned in San Diego about non-native trees. In such a mild climate, they do not develop strong roots. When the occasional strong storm blows through, the trees are uprooted. 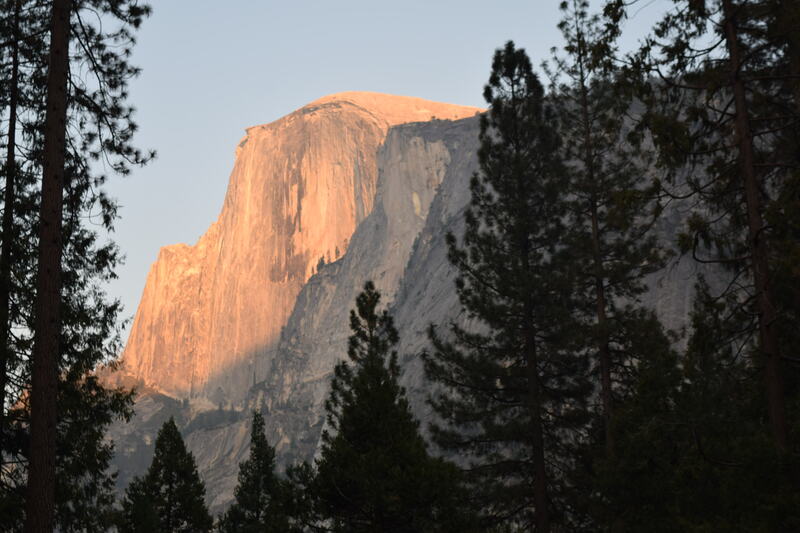 In the Yosemite wilderness, trees that grow among the granite outcropping are tougher than most. They have adapted to difficult conditions. And in the forests at lower elevations, one sees that many millions of unhealthy trees succumbed to beetles, drought and fire. When man tried to prevent fires over the years, the blazes that did start incinerated many more acres than would had nature taken its course. So there is a natural order that difficult circumstances are necessary to be healthy. Fire will destroy unhealthy growth. Those trees that are in higher elevations seem to experience less danger from fire because the fuel – underbrush – has much less opportunity to grow there. People on the other hand, want an easier life, more convenience and feel justified in actively seeking it. Sometimes we find out that the difficulties we perceive to be so hard are so minor in comparison to others’ situations. I can be ungrateful for the comforts I enjoy, the health I have, or the things I have accumulated. And it takes others in more dire situations to bring a change in my thinking. In the last few months, I’ve been fighting a bitterness that has been affecting my work ethic, productivity, and confounding my dreams of retirement next year. Listening to the drone of radio and social media about the world going to hell, politics, and then going to work in a technically-challenging industry where people also have conflicting priorities and interests has made me increasingly bitter. A son’s recent hospitalization, unhealthy romantic entanglement, and job loss has strained relationships and routine in my household. With an addiction that he is “not growing out of” without his serious engagement, and the intervention and commitment of the whole family to provide support is not a short-term obligation. Taking encouragement in the good days, helping to foster more positive outcomes and to limit exposure to things while he gains strength and coping skills. I am called to be a cheerleader now. There are other family members also are feeling the stress of a helping loved one with an addiction. Helping him develop self-determination, and taking actions to recover is a primary focus for my wife, while I am more of her support system. If I want stronger roots to withstand storms and to model that for my children, I need to pray more, demonstrate that I am applying the Word, and to share what I am learning with them. Among our church family, we have friends with adult children who are also going through various personal demons. We need to encourage and support one another. And if our church family has adult children with challenging situations, how many others – without the deep roots of a faith or support network – are trying to cope?